HKSKH Welfare Council held the 21st Outstanding Volunteer Award Ceremony on 11 March. Mr Stephen Sui, the Secretary for Labour and Welfare, attended the event as the guest of honour. Eighty-six awards in total were given to recipients ranging from a ninety-two-year-old lady to a fifteen-year-old girl. The attendance at the ceremony was about 200, comprising individual volunteers, representatives of corporate volunteer teams from companies and organizations, and guests. The council provided 150,000 hours of services last year benefiting over 310,000 people. It organizes the biennial award ceremony to commend the contributions and zeal of individual volunteers and corporate volunteer teams from companies and organizations. This year’s ceremony was themed “one more step for caring service” to encourage Hong Kong people to do just a little bit more to make those around them feel loved and cared for, even if the act needed seems trivial. This year, three people won the Honour Award and fifty-one the Gold Award, while eighteen companies were given the Caring Corporation Award and fourteen groups the Caring Organization Award. Dr Lee thanked corporate volunteer teams for being mindful of their corporate social responsibilities in providing service, care and love to the needy communities amid their busy work schedules. 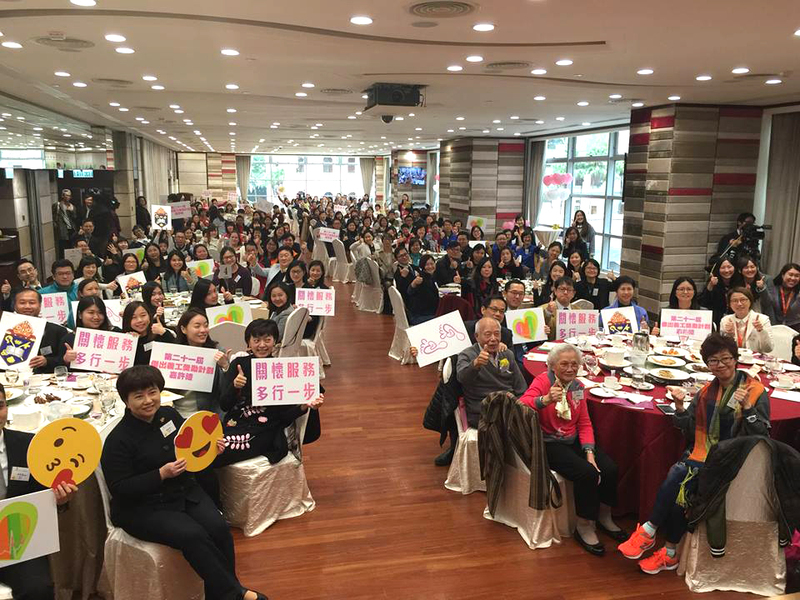 She gave an overview of her agency’s achievements in the area of volunteering: “HKSKH Welfare Council has always been dedicated to the promotion of volunteering and to training volunteers. Our team of volunteers have grown every year. The number has increased from 15,000 to 16,000 over the year, and we serve over 310,000 people every year. Such result is astonishing.” She emphaized that the Welfare Council will continue to stand by Hong Kong people in striving to promote volunteering to benefit more people and to work with all walks of life to create a society full of love and care. At the ceremony, video clips containing messages from some of the volunteers were played. They allowed those present to hear the volunteers share their stories and their work, and demonstrate how they put the spirit of “one more step for caring service” into practice. The Welfare Council also invited several volunteers to talk to the audience in person. One of them is Lam Kar-yeung, a Chinese medicine practitioner who regularly visits elderly people living alone in Ping Chau and provides free medical services to children in rural villages in mainland China. He gifted each guest with a “five-colour massage rod” and demonstrated the the “five colours of care and five ways of healthy living” massage technique. He hoped that love and care will be passed on when the guests teach those near them about the massage technique. Some people use volunteering to change other people’s lives; some people, inadvertently, change their own lives when they volunteer. Lau Hou-jin and Lau Hou-naam, a pair of eighteen-year-old twin brothers, talked about how joining the volunteer activities organized by the Welfare Council had transformed them and inspired them to change other people’s lives as well. Despite their young age, they already have over five years of volunteering experience. Different activities allow them to meet different types of people and to better understand the society. They were given the courage to step out from their secluded worlds and found directions for their roads forward. Hou-jin and Hou-naam have been enthusiastic volunteers for many years. This is the second time they won the Gold Award. Both of them said that they are working towards the Honour Award and have plans to go overseas to participate in international volunteering projects, thus helping the world come to grips with the spirit of the mottos “help people help themselves” and “it is more blessed to give than to receive”. Hou-naam and Hou-jin have provided more than 700 hours of service in total. They eagerly joined all sorts of volunteering projects, including visiting the elderly, leading children activities and even volunteering as event emcees and performers. They discovered their interests and expertise as they volunteered. The elder brother, Hou-naam, is fond of cooking, especially desserts. The younger, Hou-jin, is fascinated with twisting balloon toys. Both brothers are good with their hands and are using their handy skills to bring joy to others. Hou-jin said, “When I created a balloon twist to the kids for the first time, they were delighted. We chatted and I discovered that I can bring joy to others and I have fallen in love with balloon twisting ever since.” The brothers have now decided to return to school to master making desserts and balloon twisting. Although Hou-naam and Hou-jin as we know them today are cheerful, talkative and full of laughter, they used to be disconfident introverts and bad communicators. Dyslexics and underachievers, they were targets for supervision by social workers posted at their middle school. The twin brothers are transformed from passive people into pioneers in their peers, attracting more friends around them to join the league of volunteering. Their volunteering did not only bring changes in themselves and help to others, but also inspired others.